Sweet as can be one day and a grumpy, ear pinning, Wicked Witch of the West the next. "Mares, can’t understand them ... just too unpredictable ... give me a gelding any day!" Comments like these are typical of those shared by many mare owners describing their frustration in dealing with this equine hormonal dance. The ages-old medicinal remedies of Chinese herbs may offer just the help needed in today's world for mares and their owners. The Chinese herb Man Jing Zi (Fructus Viticus), also known as Vitex or Chastetree Berry, has been used in both Asia and Europe for centuries as a woman’s tonic and hormonal balancer.Modern research into the effects of Man Jing Zi have shown it to be effective with a number of conditions, including infertility and problematic or lack of heat cycles (anestrus). There is evidence that it can also reduce the size of uterine fibroids, pituitary cysts and tumors. Man Jing Zi’s anti-tumor properties are proving to be helpful in the management of many cases of equine Cushing’s disease. History of Chinese herbs: The written history of Traditional Chinese Medicine (TCM) and Chinese herbs dates back at least 2,000 years. One of the earliest herbal reference books dates from late Han dynasty. The Divine Husbandman’s Classic of the Materia Medica lists 364 substances many of which are still being used in modern formulations. Consequently, we benefit from several thousand years of field trails, knowledge and experience. TCM continues to grow and evolve as we explore new areas of science. Science, in turn, deepens our understanding of how herbs work. There now exist many volumes of pharmacological data to support the use of herbs in modern medical settings. Chinese herbs can be used effectively to treat diseases, symptoms or conditions that are usually treated by drugs and pharmaceuticals. One of the major benefits of Chinese herbal therapy is that, used correctly, herbal formulas have very few of the negative side effects associated with drugs. One of the ways Man Jing Zi works is by stimulating the pituitary gland to raise levels of the hormone progesterone, similar to using synthetic hormone therapies with a similar effect. Progesterone, considered by many as the calming hormone, enables the body to prepare for and maintain a pregnancy.Man Jing Zi acts as a hormonal balancer. Many of our mares' behavioral problems are associated with low progesterone levels in relation to high levels of estrogen. The hormone estrogen rises sharply just prior to ovulation. Estrogen is associated with a sense of vitality and well-being. It is the sudden estrogen spike every 21 days that signals fertility and the ability to conceive, which also brings on aggressive, unsocial, mare-ish behaviors or what so many mare owners call equine PMS. Man Jing Zi resembles a small, smooth peppercorn in size and appearance with a tiny flower on one end. It is dark grey/black in color with a slight peppery fragrance and flavor. Medicinally, the berry is used. Good quality Man Jing Ziberries are firm and smooth. You should be able to scrape the skin off with firm finger nail pressure revealing a light grey interior. Avoid extremely hard, shriveled, dusty, powdery or moldly smelling berries. Berries can be stored and sealed in a dry, cool place for up to a year. Man Jing Zi is available as whole berries, powder or in liquid extract. I strongly recommend the use of preservative free herbs. How much to use: four to eight grams of powered herb or one to two tablespoons per day is adequate for the average 1,000 pound horse. Whole berries can be ground as needed in a coffee grinder and fed in sweet feed, grain or in well soaked beet pulp. Most horses readily accept the new addition to their supplements. Who can use Man Jing Zi? Most healthy mares are good candidates. Your veterinarian should be consulted to rule out any serious concerns like an infection or ovarian tumor as the cause of the mare’s behavior. When to use: Man Jing Zi can be safely used all year long, but many mare owners report positive results utilizing a seasonal approach, feeding the herb from early March through late September. Man Jing Zi should not be used with synthetic hormones like Regumate, Ovplant and Depo-Provera or during short cycling procedures. Mares naturally come into “season” with increasing amounts of daylight. By coordinating herbal treatment with the seasons, following spring equinox to fall equinox and taking an herbal break during the winter, when daylight and hormone levels are at their lowest, we are following the mare’s natural hormonal response to light. Gracie, an eleven year old, gray quarter horse mare from Texas is a good example of successful use of the seasonal herbal approach. Gracie had taken a few years off to be bred, and her owner wanted to show her again. After two years' training and conditioning for showmanship, western pleasure and trail classes, it seemed that Gracie was always coming into season on the way to the show. While Gracie’s behavior wasn’t described as "horrible or dangerous," she was definitely a “different” horse. 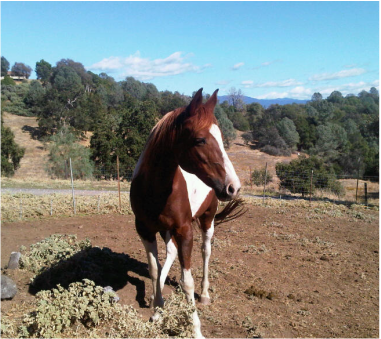 Her mare-ish behavior was described as acting too bold and talkative around other horses. She was also unable to focus or relax, always looking around the ring, easily upset when her buddies were out of sight and witchy, pinning her ears if her sides were brushed or touched. Beginning in the spring, Gracie uses a special herbal mixture containing Man Jing Zi, continuing through the fall and taking a break during the winter. Her owner reports that since starting this routine, Gracie is better able to focus and listen to her rider in the show ring and at home. While her owner still pays careful attention to her mare during her season, she reports that Gracie is much more focused and willing partner. Although we may not be able to completely overcome the effects of hormones on our mares' moods and behaviors, Man Jing Zi, combined with good horse handling/training practices and a little understanding, can be an effective tool to help smooth out the negative behaviors associated with mares.